Our business is market and eater driven, we only grow and sell what our customers tell us they want. 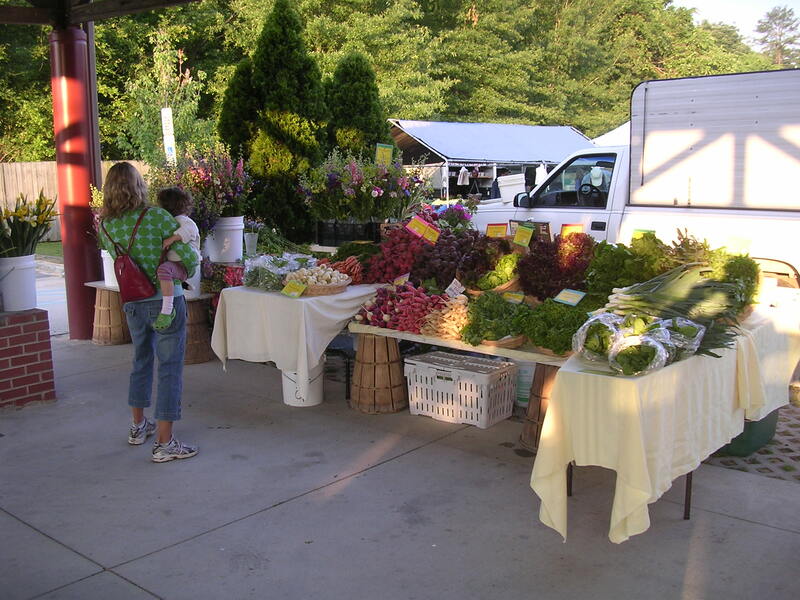 To that end our production is focused on having a bountiful display at the nationally famous Carrboro Farmers’ Market. Since 1986 we have been selling at the Saturday morning Carrboro Market. Open year round, and we are there every Saturday from February through June. We are also at the Wednesday afternoon market, 3:00-6:00, from April through June. The market is set up like a baseball diamond with two open air shelters on first and third base lines. On Saturdays look for us at the end of the shelter at third base. On Wednesdays look for us at the end of the shelter on the first base line (closest to Town Hall) at home plate and next to the gazebo. Here is a map for parking at market. Sales to fine restaurants are the final piece of the puzzle. It started with Magnolia Grill, the first James Beard award winning restaurant in North Carolina (They have two, one each for Ben and Karen). Closed in 2012, we were proud to have supplied and to have worked with the Barkers since 1984, they have helped shape Peregrine Farm and the local food scene. You can find our produce on the menus and flowers in the dining rooms of the fine restaurants below. They all shop at the Carrboro Farmers’ Market and support local farms, we have worked with all of these chefs for many years. ACME Food & Beverage Co.– Kevin is a huge supporter of the Carrboro Farmers’ market. Pizzeria Mercato– the Barkers are back! Really their son Gabe who they are working with on side dishes and desserts to go with the awesome pizza. We are growing all kinds of cool things for them. Oakleaf– Brendan and Leslie Cox are doing a tremendous job of using local ingredients to create some of the best food in the Triangle and they are fun to work with! Elaine’s on Franklin– Inspired by his southern roots, Bret is an alum of Magnolia Grill who works with local farmers to create a wide range of dishes and flavors. Pazzo– Seth is another local boy who has cooked everywhere, half pizza place half fine dining Italian restaurant, he uses our produce on the restaurant side. Postal Fish Company– Bill Hartley and James Clark have an amazing fish inspired place with not only the freshest fish but also local produce accompanying it. There are many other restaurants that buy from us at the Farmers’ Market but we are honored to grow for and work with this group of chefs.